San Francisco, Aug 9 (IANS) An elderly Sikh man was viciously attacked in California, leading to fears among the community that he may have been a victim of hate crime, the media reported. The older teen is the son of the police chief of Union City. 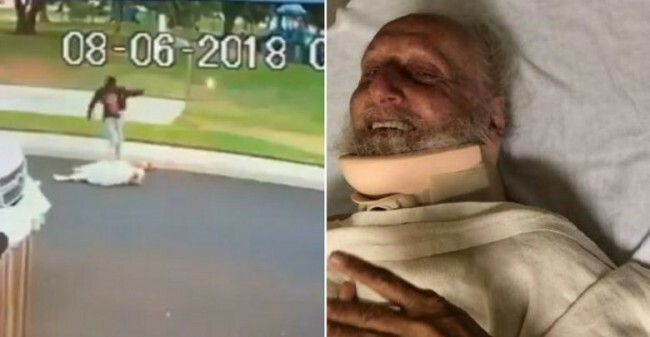 Surveillance footage from a nearby home released by the Manteca Police Department allegedly shows Tyrone Keith McAllister, son of Union City Police Chief Darryl McAllister, and a 16-year-old boy confronting Natt, who was taking his daily walk Monday morning along Greystone Park on Turquoise Way. Footage shows two people walk up to Natt at around 6 a.m. when one of the individuals, wearing a dark hoodie and jeans, suddenly kicks him to the ground, police said. The attacker, identified by police as McAllister, and another assailant then walk out of frame, leaving Natt writhing in pain on the ground. The video then shows the suspect charging back and delivering at least three kicks to Natt’s head and upper body before yelling something inaudible and fleeing the scene. One of the two suspects also might have waved a gun in the air, San Francisco police quoted the police as saying. “It’s not an attack on an individual, it’s an attack on an entire community,” said one speaker. Natt was at the community event with his family by his side. His daughter, Rupinder Kaur, told the media that Natt is paralyzed on the left side of his body because of previous medical issues and could barely speak. Malhi said the two attackers yelled, “Go back to your country”, and then began beating him.